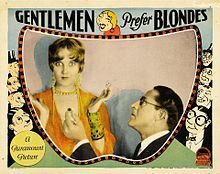 Gentlemen Prefer Blondes is a 1928 American silent comedy film directed by Mal St. Clair, co-written by Anita Loos based on her novel, and released by Paramount Pictures. No copies are known to exist, and it is now considered to be a lost film. The Broadway version Gentlemen Prefer Blondes starring Carol Channing as Lorelei Lee was mounted in 1949. It was remade into the film Gentlemen Prefer Blondes with Jane Russell as Dorothy Shaw and Marilyn Monroe as Lorelei Lee in 1953. ^ Thompson, Frank T. (March 1996). Lost Films: Important Movies That Disappeared. Carol Publishing Corporation. pp. 12–18. ISBN 978-0-8065-1604-2. Wikimedia Commons has media related to Gentlemen Prefer Blondes (1928 film). This page was last edited on 13 February 2019, at 02:14 (UTC).